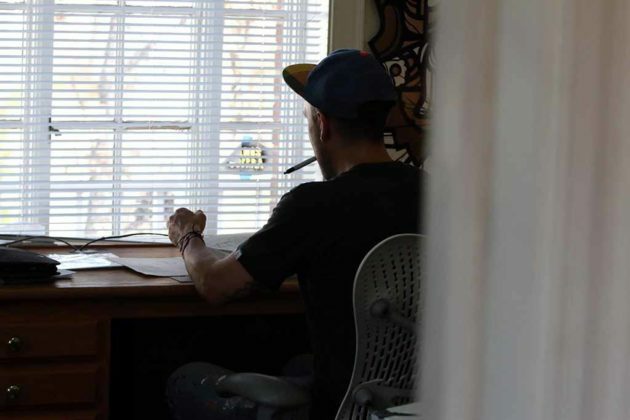 Mas Paz works in his studio office at home in Arlington. 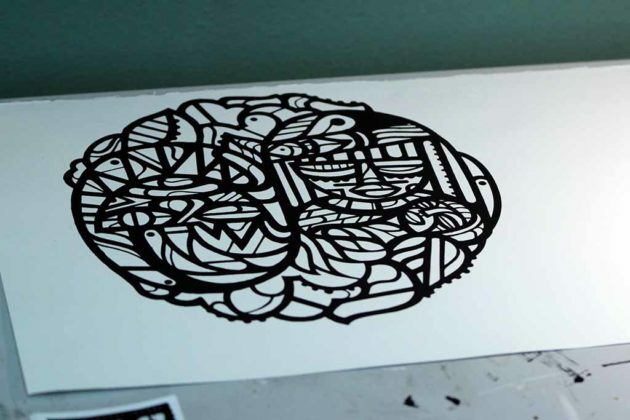 A screen printing in Mas Paz’s studio. 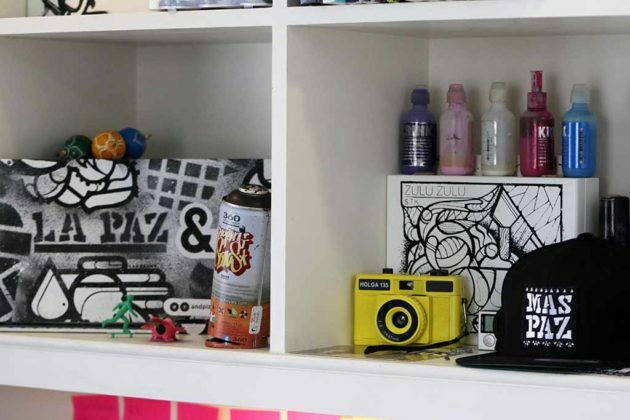 A peak into Arlington native artist Mas Paz’s studio office. 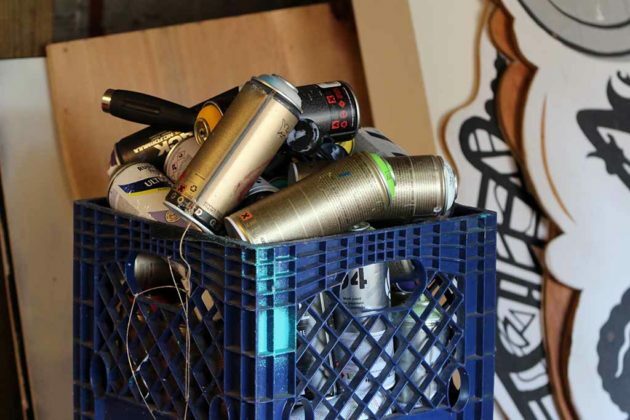 Spray paint in Mas Paz’s garage studio. 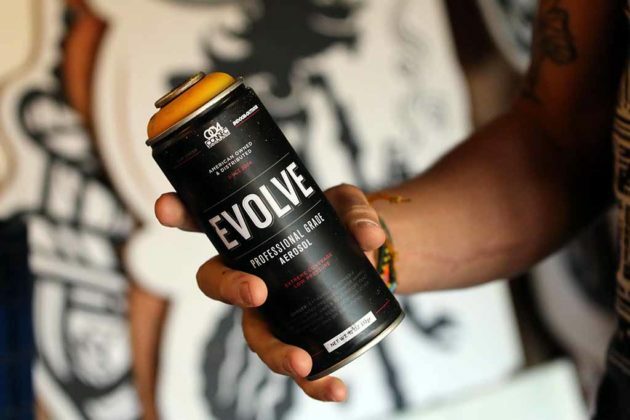 Mas Paz shows off the spray paint he uses for his work. Mas Paz poses with one of his pieces. 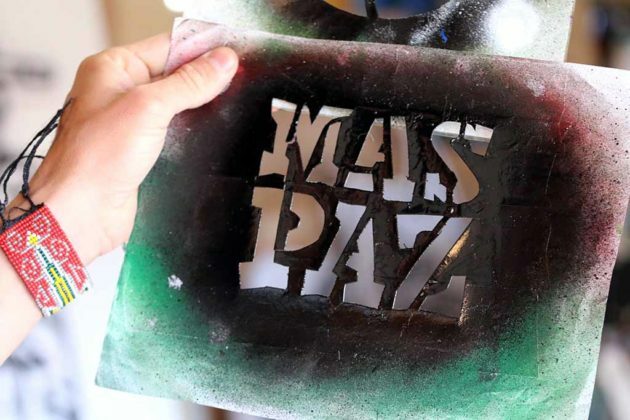 Mas Paz holds up a graffiti stencil. 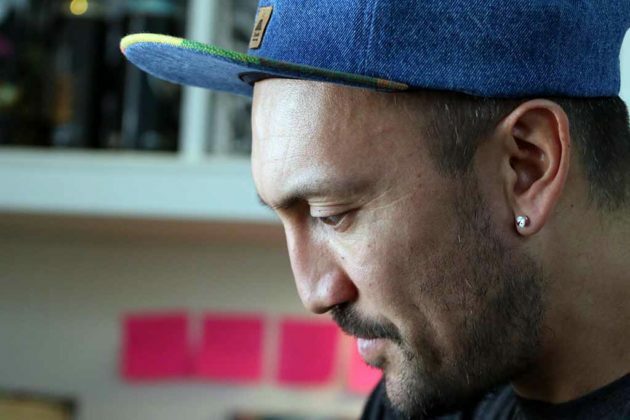 Though his art can be spotted across the globe, artist Mas Paz calls Arlington home. 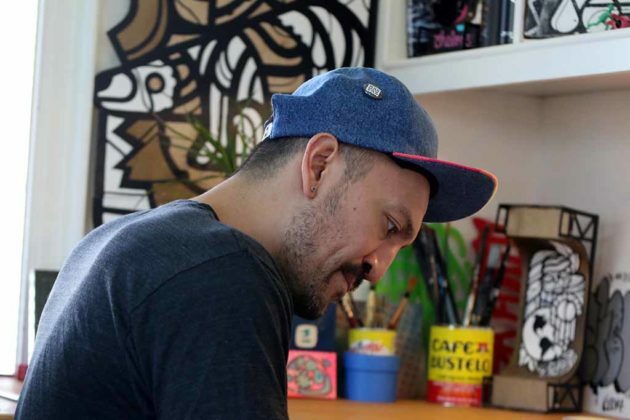 Mas Paz, whose real name is Federico Frum, describes his work as indigenous contemporary art, using graffiti and standard bucket paint as his media. 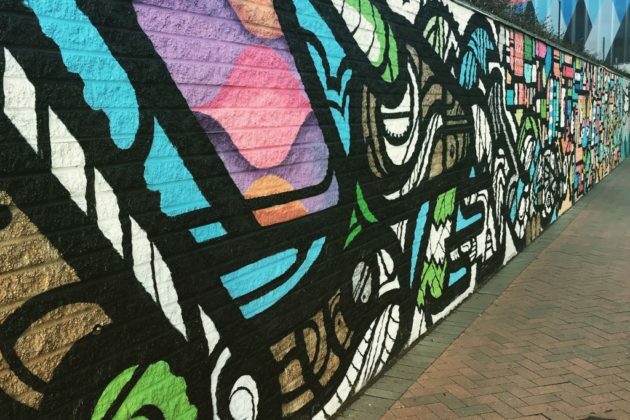 His work has been featured at the Smithsonian Institution, the Corcoran Gallery Art, and New York City’s The New Museum, but his murals can be found as far away as Pakistan and Mexico and as closeby as Crystal City. 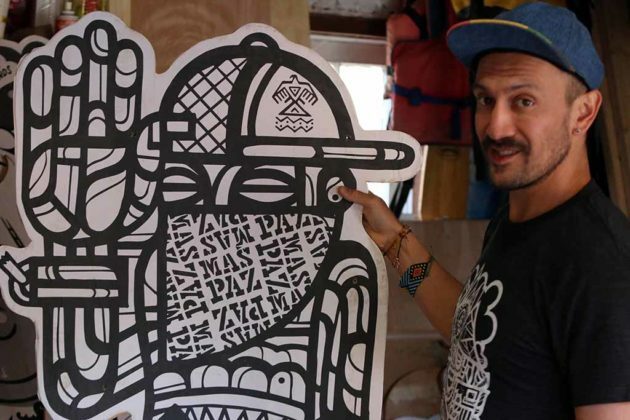 Frum has traveled the world to teach mural workshops, and in February he was invited by the American embassy in El Salvador to teach children how to paint street murals. Born in Bogota, Colombia, Frum — whose pseudonym means “more peace” in Spanish — was adopted when he was a year old and raised in Arlington. He graduated from George Mason University with a degree in art and visual technology in 2005. Frum moved to Brooklyn a year after graduating, living there for seven years while selling t-shirts on the street in between 3D modeling and screen printing. He then traveled through South America before returning to Arlington ready to come home. He now works out of his house in the Arlington Ridge neighborhood. Mas Paz initially started as just Paz, his New York graffiti tag. That was before his friend Youth Waste approached him to create his own stickers, and Paz didn’t fit neatly on the square template that they wanted. That’s when Frum decided to send more of a message, adding the mas to paz. 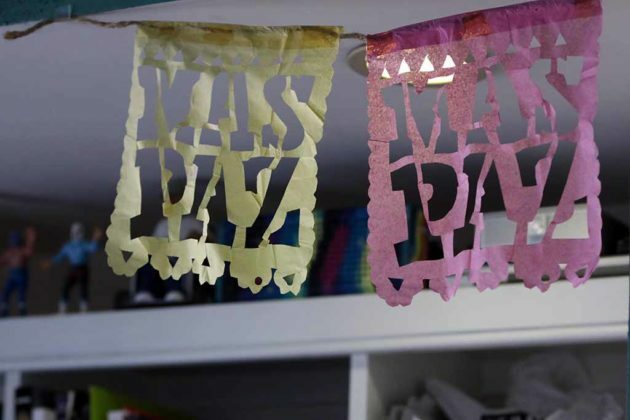 Frum also wanted a message so in 2012 when he added Mas Paz, which translates to more peace in English, he had found the right fit and meaning. Indigenous art has become a way for Frum to express and explore who he is, even though there are pieces of him he will never truly know, such as where exactly he was born. Five percent of all his project earnings go toward the orphanage that he lived in as a child, La Casa de La Madre y El Nino. There are no days off for Frum, but he says that it never feels like he’s working when he’s making art. The work makes the days fly by, and he doesn’t plan on stopping anytime soon. 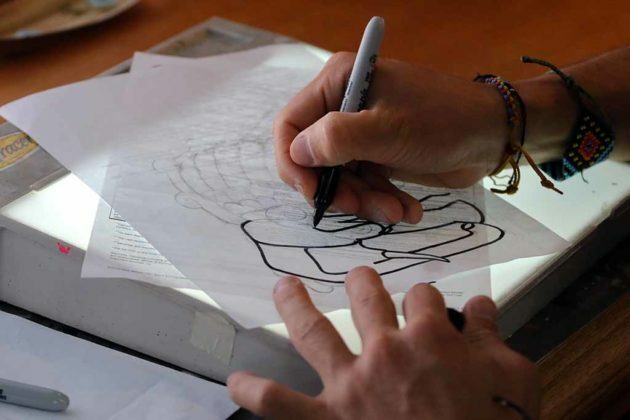 “I intend to be 90 years old and still creating,” he said.